During March–June 2003, a survey prior to development was conducted in the region between Highway 10 and Ramat Bet Shemesh (Permit No. A-3869*). The survey, undertaken on behalf of the Israel Antiquities Authority and underwritten by the Ministry of Housing and Construction, was directed by A. Nagorsky, with the assistance of D. Weiss, H. Stark and L Barda (GPS). The survey region lies within the precincts of Horbat Zanoah and a flat hill to its south (map ref. NIG 1996–2006/6240–56; OIG 1496–1506/1240–56). The western part of the wadi that separates the two hills is covered with a large heap of soil that was deposited during the development work in Ramat Bet Shemesh. The eastern part is a cultivated area of grain fields, which conceal any antiquities that may be located underneath. Seventy-seven sites (Fig. 1) were recorded in the surveyed area, including ruins, caves, rock-hewn agricultural installations, a columbarium, a limekiln, cisterns, stone clearance heaps, terraces and remains of ancient roads. Ruins (Nos. 3, 20). At Site 3 were remains of structures (40 × 50 m) whose walls are built of well-dressed stones. 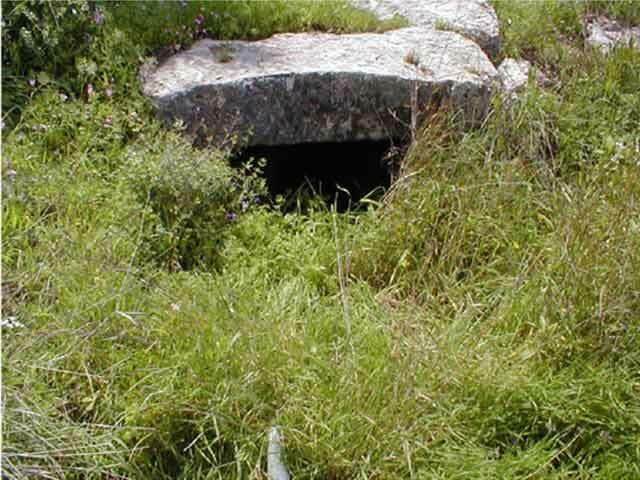 A cistern with a rectangular opening (1.0 × 1.2 m) was exposed and to its north was a hewn opening of an underground installation (Fig. 2). Fragments of pottery vessels collected from the ruin dated to the Early Roman, Late Roman and Byzantine periods. Remains of buildings at Site 20 consisted each of three–four rooms arranged around a courtyard. Remains of a large building in the center of the ruin were surrounded by installations: Columbarium 16, Limekiln 18, and Olive Press 19. The walls of the buildings were constructed from fieldstones and well-dressed stones. Due to illicit excavations at the site, a large quantity of stone collapse, potsherds from the Roman and Byzantine periods, grindstones and fragments of glass vessels were found in the soil fills inside the rooms. It is assumed that an ancient road (No. 8) had led to the ruin. A large soil spill separated the two ruins (3 and 20) and in fact, they were probably parts of the same site. Winepresses (Nos. 11, 15, 22, 25, 39, 59, 65, 68, 69). 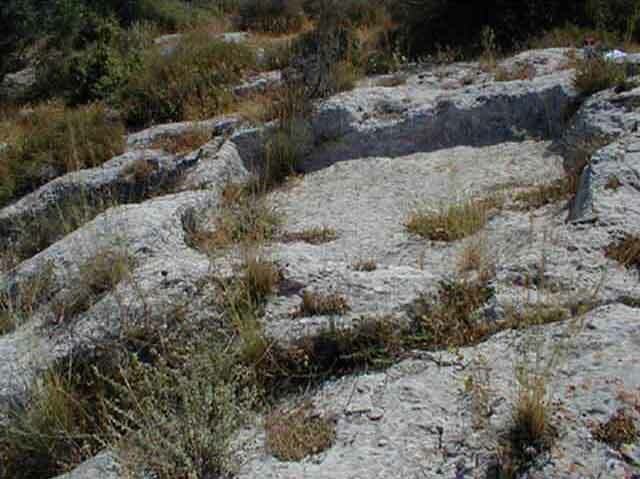 Winepress 11 had a rectangular bedrock-hewn treading floor (2.6 × 3.1 m; depth 0.4 m); its surface sloped to the east toward the collecting vat (1.0 × 1.1 m), which was filled with earth and stones (Fig. 3). Winepress 15 had a square treading floor (3 × 3 m; depth 0.5–1.0 m) and a collecting vat on its eastern side. A hewn basin (diam. 0.5 m) was located above the southeastern corner. Winepress 22 had a shallow treading floor (3 × 3 m) and a collecting vat in its northeastern corner that was found filled with alluvium. Winepress 25 had a treading floor (2 × 4 m, depth 0.45 m) and a settling pit (0.45×0.45 m) in its northern side. North of the treading floor was a rock-hewn collecting vat that had been destroyed when a burial cave was quarried. The cave’s burial chamber extended below the treading floor and its façade faced north (length 3 m; Fig. 4). Winepress 39 had an especially small treading floor (1.5 × 2.0 m). Winepress 59 had a treading floor (2.5 × 3.0 m; depth c. 0.4 m) and a rectangular collecting vat (1.0 × 1.5 m) to its north. In a later period an opening to a cave was hewn in the vat. Some 4 m to the east was a bedrock surface with ten hewn cupmarks. Winepress 65 had a square treading floor (2.4 × 2.5 m; depth 0.5 m) and a collecting vat to its north. In a later period the opening of a cave, which extended below the treading floor, was hewn inside the vat. Winepress 68 consisted of a large treading floor (3 × 4 m; depth 0.5–0.7 m) and had a collecting vat along its northern side (Fig. 5). 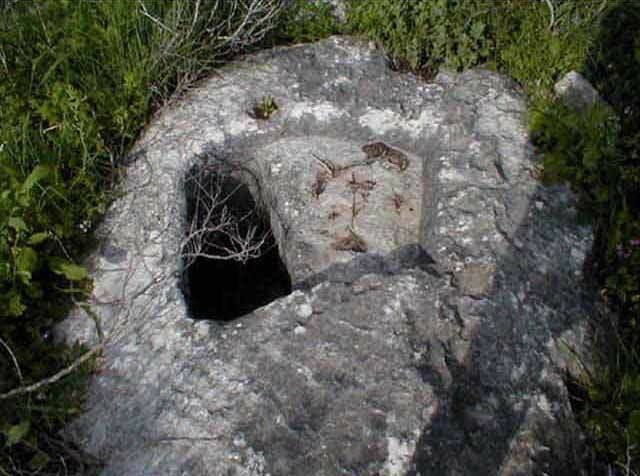 Winepress 69 had a small shallow treading floor with round corners and a square rock-hewn collecting vat (2 × 2 m) to its north. Bodedot (Nos. 7, 13, 21, 30). Installation 7 was hewn on a leveled bedrock surface. Bodeda 13 had a round press bed (0.90 × 1.05 m) and a cupmark for collecting liquid (diam. 0.5 m). Bodeda 21 had an elliptical press bed (0.5 × 0.7 m) and a rectangular cupmark (0.45 × 0.50 m; Fig. 6). Bodeda 30 was located in an area of farming terraces and had an elliptical press bed (0.45 × 0.60 m) and a cupmark for collecting liquid (diam. 0.4 m). Burial Caves (Nos. 14, 17, 40, 42, 48, 49, 55, 56, 57, 61, 70, 73, 74, 77). Burial Cave 14 had a hewn façade (length 3 m). The cave opening was rectangular and surrounded by a hewn frame (Fig. 7). Cave 17 had a built courtyard in front of the entrance that faced north. The cave’s facade was hewn in an elongated bedrock cliff and it can be assumed that other caves were hewn the length of it. Cave 40 had a partly hewn and partly fieldstone-built courtyard. The cave’s façade was hewn (length 2.7 m). Cave 42 also had a hewn courtyard. Cave 48 had a rectangular opening (width 0.75 m), fronted by a built courtyard (4 × 5 m); the cave was filled with earth and stones. The façade of Cave 49 was bedrock-hewn (length 2.5 m). Three burial caves at Site 55 were located c. 10 m apart. Signs of illicit excavations in front of the cave openings were visible. Burial Caves 56, 57, and 61 had hewn facades (length 1.5 m). 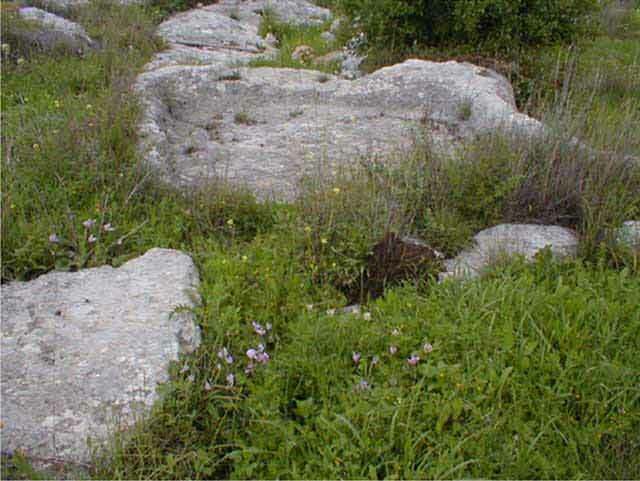 Remains of an olive press and the negative of a crushing basin (yam) were next to Cave 56. The rectangular opening of Cave 70 was bedrock-hewn and enclosed within a frame. The façade of Cave 73 was concealed behind vegetation and near it was a soil heap that contained human bones. Caves 73, 77 had rock-hewn facades and their openings faced north. Water Cisterns (Nos. 43, 52, 71). Three rock-hewn cisterns with round openings were documented (No. 43—diam. 1.2 m, No. 52—diam. 1.5 m, No. 71—diam. 0.8 m). The cisterns were filled with stones and soil. A square rock-hewn frame where a cover was placed surrounded the opening of Cistern 71. Building Remains (Nos. 33, 50, 60). The walls of Building 33 (6 × 6 m), preserved two–three courses high, consisted of medium-sized fieldstones. Building 50 was square (8 × 8 m) and Building 60—rectangular (5.0 × 5.5 m). The walls of Buildings 50 and 60 were composed of coarsely dressed stones and preserved three courses high. The three structures were probably field towers. Limekilns (Nos. 18, 66). No. 18 was mentioned above in the area of Ruin 20. 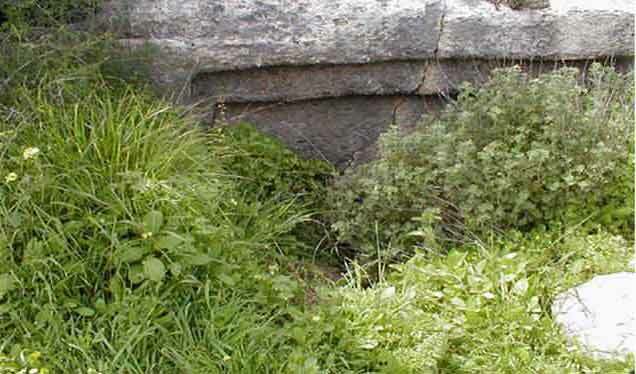 Limekiln 66 had a horizontal row of fieldstones arranged around a pit (diam. 5.8 m) that was visible to a depth of four courses. The interior of the kiln was filled with soil and vegetation. Rock-hewn Installations (Nos. 64, 67). The negative of a crushing basin (yam; diam. 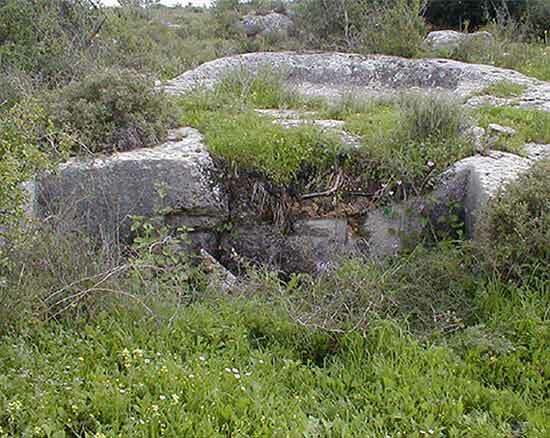 1.2 m, hewn depth 0.3 m) of an olive press was discovered in Installation 64. Installation 67 was rectangular (width 0.8 m). Cupmarks (1, 4, 10, 23, 24, 27, 29, 31, 38, 51, 58, 63). Twelve cupmarks (diam. 0.3–0.6 m) were found in the survey area. A hewn frame around Cupmark 24 served for placing a lid to close it. Three cupmarks (diam. 0.2 m each), hewn next to each other, were found at Site 31. A cluster of three cupmarks was located at Site 63; one of them is large (diam. 0.3 m) and the other two are smaller. Quarries (Nos. 44, 53, 72). Three small quarries (each c. 10 × 12 m). Stone Clearance Heaps (Nos. 32, 36, 37, 47). Stone Clearance Heap 32 (8 × 8 m) consisted partly of dressed stones and it may be the remains of a collapsed building. Three other stone heaps comprised small and medium-sized fieldstones (diam. c. 3.5 m). Cave Dwellings (Nos. 6, 54, 76). Cave 6 had a wide opening that faced south. Cave 54 had a narrow hewn corridor (1 × 3 m) that led to an irregular-shaped opening. The ceiling of Cave 76 collapsed; however, the void (diam. c. 7.5 m) could still be discerned. Numerous walls of farming terraces and retaining walls that delimited cultivation plots were discerned on the slopes of the hill. Many fragments of pottery vessels were found on the slopes and dated to the Iron Age and the Early Roman, Late Roman and Byzantine periods. 1. 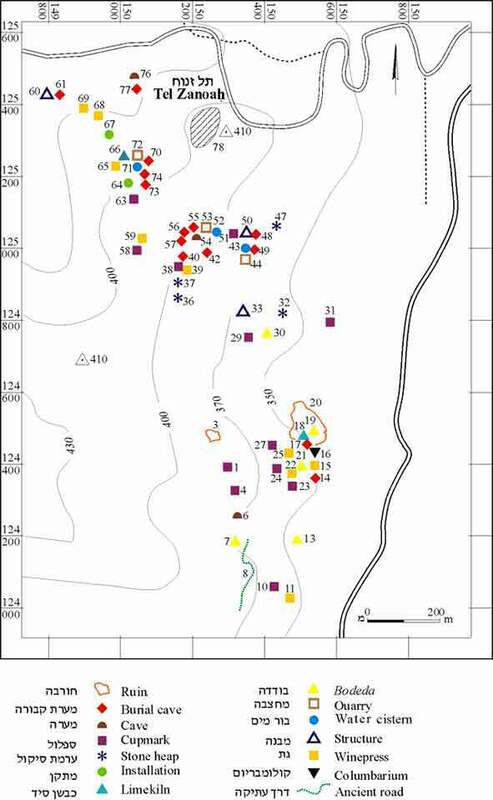 Distribution map of sites in the survey. 2. Site 3, a hewn opening of an underground installation, looking west. 3. Site 11, a rock-hewn winepress, looking southwest. 4. Site 25, a winepress and a burial cave below it, looking south. 5. Site 68, a rock-hewn winepress, looking southwest. 6. Site 21, bodeda, looking north. 7. Site 14, a burial cave, looking west.